An video interview with Don Macon and R. Lee Clark as part of the Texas Medical Center History Makers Series. 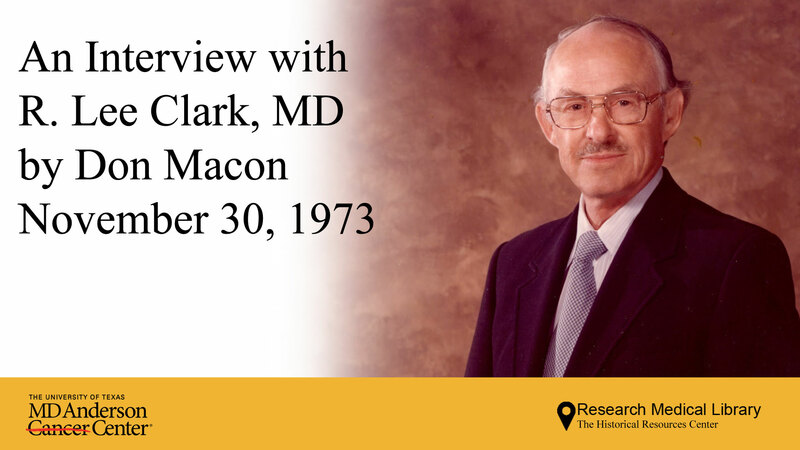 R. Lee Clark begins by giving an overview of the history of MD Anderson, and the significant events and developments which occurred from its conception to the then present day. 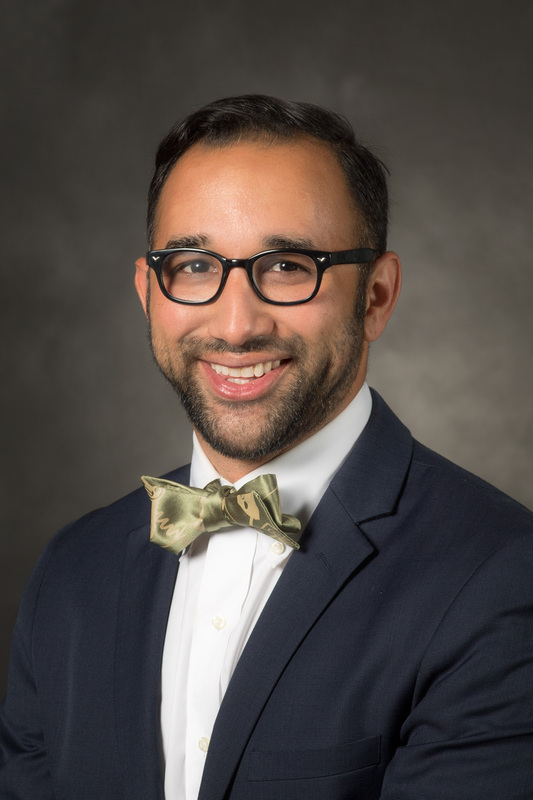 Next, Dr. Clark discusses MD Anderson’s standard of excellence philosophy regarding medical care which strives for the continued betterment of existing practices through medical research. 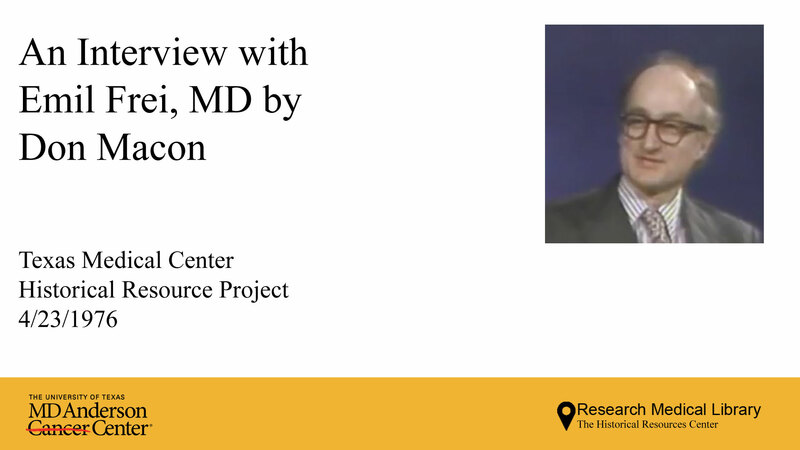 Lastly, Dr. Clark discusses how MD Anderson uses a multidisciplinary approach in an effective and efficient manner, and discusses future plans for the treatment of cancer. Dr. Frei discusses the work he did at the Sidney Farber Institute (formally the Children's Cancer Research Foundation, and currently the Dana–Farber Cancer Institute), the National Cancer Institute with Dr. C. Gordon Zubrod, and MD Anderson. These projects and research revolved around drug testing and drug development such as using Methotrexate and Prednisone to treat patients. 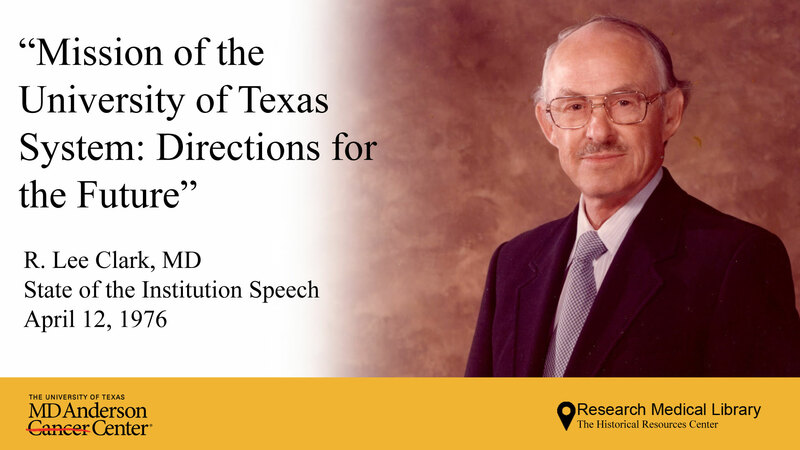 He also talks about the Department of Developmental Therapeutics at MD Anderson and its significance. 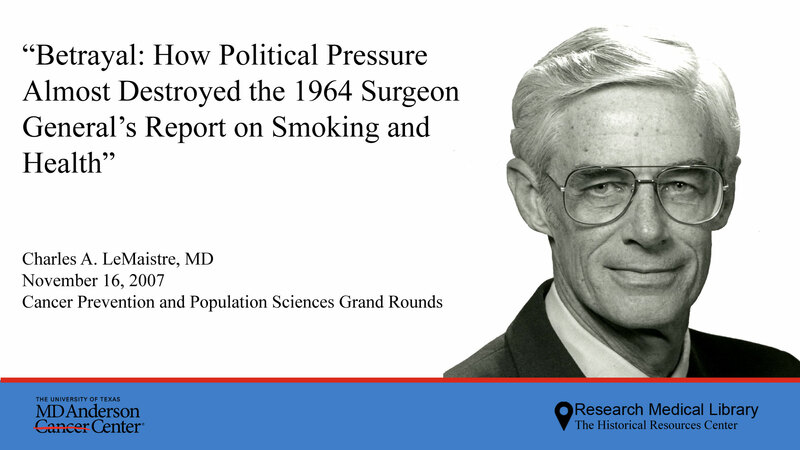 Dr. LeMaistre begins by discussing the massive spread of disease and cancer which was occurring at the time the Advisory Committee to Surgeon’s General on Smoking and Health was formed. Dr. LeMaistre then talks about the events that led to the creation of the Advisory Committee on June 19, 1962. Dr. LeMaistre explains that this committee was formed to assess the evidence of the causal connection between health and smoking. Surgeon General Terry served as chairman with 10 other members. Next, Dr. LeMaistre discusses how the committee realized there must be new approach to the evaluation of existing scientific evidence to determine causation or the study would fail. Then Dr. LeMaistre talks about how the new criteria revolutionized epidemiology, and discusses the results of the report as well as the effects. Eleanor MacDonald discusses her family background, and the family influences that lead her to work in statistics and medicine. Next, Ms. MacDonald talks about becoming a Principle Statistician for cancer research. She then discusses her career accomplishments such as developing the cancer registry for the Department of Cancer Research in Connecticut. Finally, she explains how a chance meeting with Dr. R. Lee Clark at Memorial Sloan Kettering Cancer Center in New York led to joining MD Anderson. 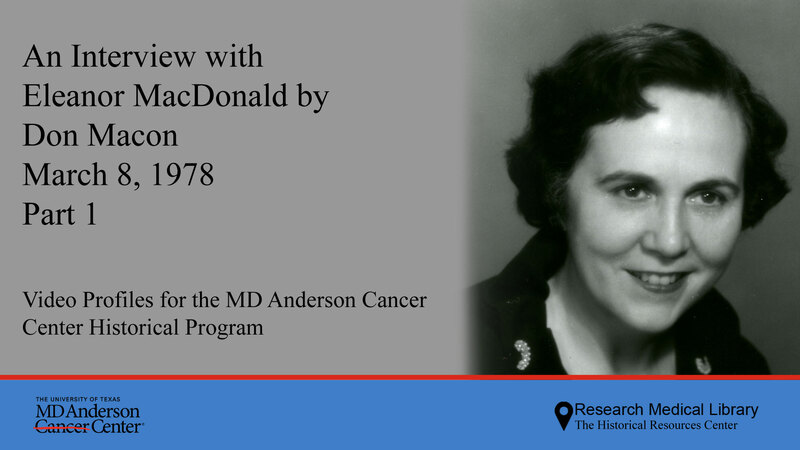 Eleanor MacDonald discusses the numerous formative life experiences and activities she was involved in outside of MD Anderson. Next, Ms. MacDonald discusses the social and cultural influences of her transformative experience in Europe. Then Ms. MacDonald talks about family connection with Dr. R. Lee. Clark. Lastly, the comradery at MD Anderson is discussed including the lifelong friendship she formed at MD Anderson with her colleague Marion Lowrey. 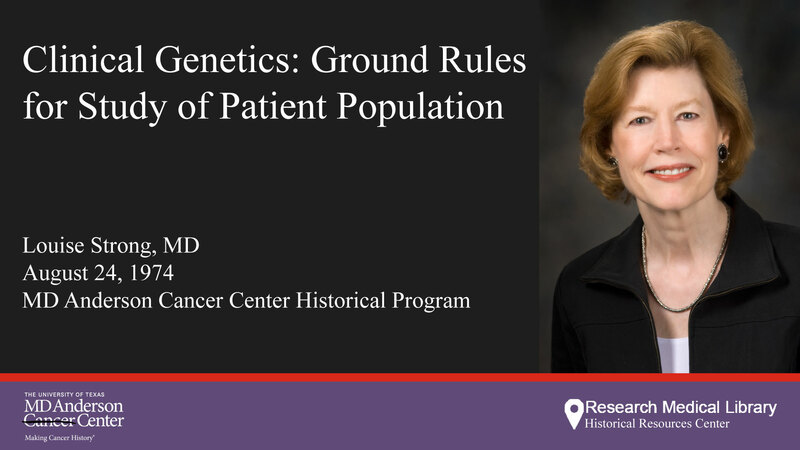 Dr. Strong's presentation focuss on genetic variation and how this relates to cancer including hereditary tumors, conditions which predispose to cancer, and environmental factors. She explains how she will talk about several different types of cancer a why they provide unique information and data for research and studying the how’s and whys of cancer such as why people with certain preexisting disorders or conditions have higher instances of certain kinds of cancer.